The most common venomous snakes in North America are the rattlesnake, the cottonmouth, the coral snake, and the water moccasin. 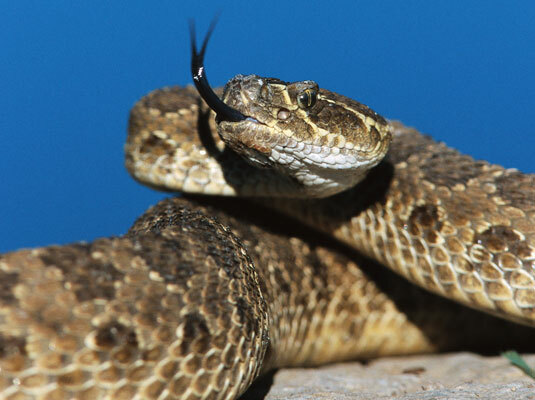 If venomous snakes live near you, learn to identify them and stay away from them. Consider taking your dog to a snake-proofing session, where she will be taught to stay away from snakes. You can obtain information from your local dog club. Restrain and calm your dog to slow the spread of the venom. Allow the snake bite to bleed freely for 30 to 60 seconds and then cleanse and disinfect the area. Place gauze over the wound and apply pressure. If the wound is on a leg, leave gauze over the wound and wrap the leg with cohesive bandage tightly, but not tight enough to cut off circulation. Take the dog to a veterinarian immediately. Do not cut into the wound caused by a snakebite. Do not apply suction to the wound. And do not apply a tourniquet. If you and your dog hike frequently in snake-infested areas, talk to your veterinarian about whether you should carry antivenom (also called antivenin) with you.